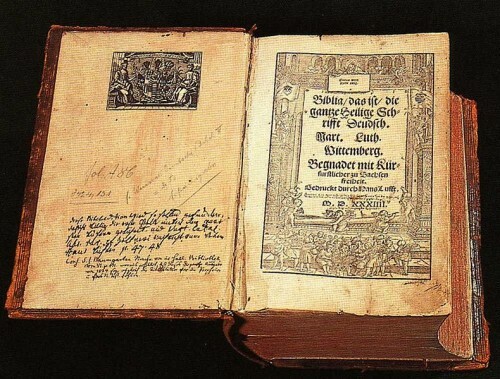 The Martin Luther Bible translation was begun at the Wartburg castle, where he was held prisoner by Frederick the Wise of Saxony for his own safety from May, 1521 to April, 1522. With eleven months on his hands and nothing to do, Luther studied and wrote prodigiously. He completed a translation of the New Testament from the original Greek in a mere four months between November of 1521 and March of 1522. After his release, he extensively revised it with the help of the learned Philip Melancthon, his friend and co-worker throughout the time of the Reformation. The New Testament was released September 21, 1522, and a second edition was produced the same December. Luther went immediately to work on the Old Testament, producing the Pentateuch in 1523 and the Psalms in 1524. By then he had acquired an entire committee that met once per week. Even Jewish rabbis were consulted [an important point, as Luther is a noted antisemitist]. Finally, in 1534 a complete version of the Bible, with Apocrypha, was released. They referred to the Apocrypha as "books not equal to the Holy Scriptures, yet good and useful to read." Even the Roman Catholic Church had not yet canonized the Apocrypha—that happened at the Council of Trent in 1546—so this was not a controversial position. A previous version of the Bible in German, made from the Latin Vulgate, had been produced in the 14th century by unknown scholars. Wycliffe had also translated the Bible into English in 1380, also from the Latin Vulgate. Between the invention of the printing press in 1440 and the Reformation, the German translation was the most frequently printed Bible except the Vulgate. At least 17 editions were produced in that time. The Martin Luther Bible, however, captured the German people and everywhere read. It was also made from the original Hebrew and Greek and was so far superior that the old version entirely disappeared. As an interesting aside, the Martin Luther Bible has a lot to do with the King James Version only debate. Those that hold to KJV only have to provide a Bible in all languages, not just English. They have chosen Luther's 1545 edition as their German champion. Martin Luther was not a great scholar of Hebrew and Greek. As said, he relied for help there from Melancthon. Luther's genius for the German language, along with Melancthon's Greek and Caspar Cruciger's Hebrew and Chaldee, made for the most excellent translation in the vernacular there had ever been. Good or bad, however, the Martin Luther Bible helped change the world. The Reformation did not just change Christianity. Despite the fact that Lutheranism was still promulgated through the state, the Reformation paved the way for a free society, where the government would not dictate the beliefs of the people. The Martin Luther Bible helped make that happen by putting the Scriptures in the hands of the people of Europe. Martin Luther continued to revise his Bible translation for the rest of his life, publishing the last edition in 1545, just a year before his death.